The number of fatal Las Vegas car accidents has increased for the last three years, according to the Las Vegas Metropolitan Police Department. To reduce these accidents, LVMPD has announced that officers will prioritize enforcement and stop responding to non-injury car accidents. This shift may have unintended consequences for individuals involved in less severe accidents, especially when a motorist’s injuries are not immediately obvious. Take a photograph before moving the vehicle to provide visual documentation. Exchange personal information and insurance information with the other driver. Obtain information for the other vehicle, including make, model, license plate and VIN. Take down contact information for any passengers in the other vehicle. Drivers may want to write down or otherwise record what they remember of the accident. Next, drivers should contact their insurance companies. Finally, drivers should complete a form SR-1, which must be submitted to the Department of Motor Vehicles within 10 days of the accident. Following an accident, drivers should be alert to signs of injury, as some injuries may not be apparent immediately. For example, the symptoms of soft tissue injuries, such as nerve damage, sprains and whiplash, may not surface until 24 to 48 hours after an accident. 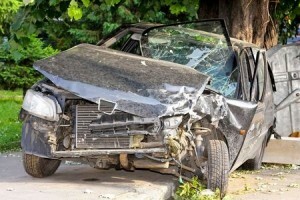 An individual injured in a car accident may be entitled to compensation if the other driver caused the accident. However, the individual must prove the other driver was at fault and provide documentation of the resulting personal injuries. Soft tissue injuries and other car accident injuries that are not immediately evident can be difficult to document. Many of these injuries cannot be detected through simple tests such as x-rays. If an accident was initially classified as a “non-injury” accident, it may be difficult for victims to prove an injury did occur. Without an official police report, proving the other driver was at fault may also be more challenging. Police reports often contain an officer’s evaluation of which driver was negligent. If signs of injuries do surface after an accident, victims should seek medical attention immediately. Then, victims should consider meeting with an attorney for advice on making a claim with limited evidence from the accident scene.